JCB Skid Steer approached the industry in a different way than most skid steers, instead of offering the most power, JCB offer the best in class safety and has a 270 degree visibility all around the cab. Being the safest in its class every JCB Skid Steer needs to have a good set of tires underneath them. Monster Tires offers great prices on sets of tires for JCB Skid Steers and offer the best shipping prices and speed when it comes time to get them to your shop or job site. Are you shopping for Skid Steer Tires for your JCB 300-330, 205-280, or 135-190? If so, we have what you are looking for here at Monster Tires! Whether you need a Front Tire Set for JCB Skid Steer, a Rear Tire Set for JCB Skid Steer, or a full Set of four tires for JCB Skid Steer, Monster Tires has the affordable, dependable heavy equipment tires you need to get your piece of equipment rolling again. High Quality and Affordable Solutions for all JCB Skid Steer Tires. Heavy equipment tires wear out with use. When you go to replace them, you need to make sure that the tires you replace them with have the traction and durability you need to be able to get the job done safely and well. You also need to make sure that the price is something you can afford. At Monster Tires, we work hard to make sure you have the quality and affordability you need. 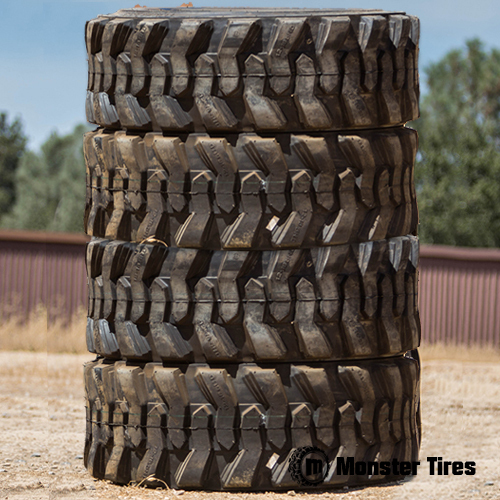 Trust in Monster Tires for your next set of JCB Skid Steer Tires!